Avoiding flicker while shooting high speed (slow motion) video under artificial lighting, or shooting in a foreign country can be a challenge. I knew HOW, but not WHY. Now I know why, and I want to share with you. This show was fully scripted and read off a teleprompter, so this script is pretty darn accurate! This transcript is in both time-stamped and plain-text form. If you're looking for a specific time stamp, use the first one. If you just feel like reading it… scroll down to the second. I want to share that with you. it becomes impossible to avoid the flicker. talk about what it is. of a second, and half of that is 1/60th. shooting 30p that’s 1/30th of a second. Shoot 60p and that drops to 1/60th, and so-on. So again, remember that limitation. fluctuation that we measure as a frequency. of the world uses a 50 cycle, or 50Hz system. see it, but it’s happening. see - as a flicker. avoid flicker. I’ll start with frame rate. any shutter angle or shutter speed you want. same point of the sine wave on every frame. and you’ll have an even exposure. along the wave, and different for every frame. are plenty of tools out there to make it easy. and made my own calculator. Here’s the formula. and 324 degree shutters are our options. of a second, 1/60th, 1/40th, 1/30th, and 1/24th. is 33⅓, by 4 is 25. Nice and easy. anything faster than 1/120th of a second. it turns out there’s at least one more trick. slow motion video and not all of it is outdoors. below. See you next time! Under certain artificial lighting situations, especially when traveling internationally or shooting high frame rate — slow motion — video, we can get flicker in our shot; we’ve all seen it. Now as many of us know, to eliminate it, our camera must have the “right” combination of frame rate and shutter speed or shutter angle. And I’ve known HOW to eliminate it for a long time, but until recently, I never truly understood what was actually happening, or the math behind the solution, or even why there are limits to how high of high speed video you can shoot in artificial light — but now I do, and I want to share that with you. Filmmaker Griffin Hammond made a video called “Three math hacks every filmmaker should know” (I’ll link to it at the end of this video; you should definitely watch it) where he talked about avoiding light flicker from artificial lighting and he said something that really clicked in my head… that between shutter angle (or shutter speed) and frame rate, you only had to get one of them right to avoid the flicker. Now, fundamentally I already knew this; if you’re shooting at 30 frames per second in North America, or 25 frames per second in most of the rest of the world, then you can shoot at any shutter angle or speed you want and light flicker won’t be a problem. It’s when you bring an NTSC camera to a PAL region or vice versa, OR when you start shooting high frame rate for slow motion video, that this flickering becomes a problem. AND there’s a limit to how many frames per second you can shoot before it becomes impossible to avoid the flicker. To fully explain this, there are two fundamentals we need to be clear on. First, why shutter speed or shutter angle have limits when shooting video, and second, how the power system and therefore electric lighting works. I recently did a video explaining shutter angle vs shutter speed, and the creative reasons you may want to choose one angle or another, so I’ll link to that at the end of this video as well. For now though, let’s just talk about what it is. Shutter angle is a term that comes from shooting movie film, where instead of shutter opening and closing like it does for still cameras, a disc would spin in front the film as it moved past the lens, rotating one full revolution per frame of film. That disc would have an opening in it, which let light through to expose the film. A disc is of course 360 degrees, and the opening in that disc was expressed as a shutter angle. A 180 degree shutter is a disc that has a 180 degree opening, or exactly one half of the disc. You can choose a much smaller angle, or a larger one, but of course the shutter angle can’t be any bigger than 360 degrees, or open all the time. This is an important point; remember that. Converting shutter angle to shutter speed requires that you know the frame rate, (or frames per second) as well. A 180 degree shutter at 30 frames per second means the shutter is open for 1/60th of a second. 180 over 360 equals 1 over 2, or half. At 30 frames per second, the longest an exposure can possibly be is one thirtieth of a second, and half of that is 1/60th. Since the shutter can’t be open for longer than that frame is being recored, your exposure duration is limited. Just like the shutter angle can’t be more than 360 degrees at any frame rate, the shutter speed can’t be more than one over the frame rate. If you’re shooting 30p that’s 1/30th of a second. Shoot 60p and that drops to 1/60th, and so-on. So again, remember that limitation. Now let’s talk about electrical power. Unlike the light from the sun, which is constant, electric light requires a power source, and the AC power system isn’t constant. In fact it’s in the name; AC stands for Alternating Current. It delivers power in a very fast fluctuation that we measure as a frequency. In North America, we have a 60 cycle per second frequency, called 60Hz, and most of the rest of the world uses a 50 cycle, or 50Hz system. The power fluctuation follows a sine wave, with two peaks per cycle, so a 60Hz system has 120 peaks per second, and a 50Hz system has 100 peaks per second. This Cycled Power Delivery Source means that a light it is powering actually gets turned all the way up to max brightness, then drops towards zero, briefly passing zero before moving back to full power again, 100 or 120 times per second, introducing a flicker. This flicker is too fast for the human eye to detect, so we don’t normally see it, but it’s happening. When shooting video under this kind of lighting, it’s critical that the shutter speed, or shutter duration, lines up with the sine wave perfectly. When the exposure starts and ends at the same part of the sine wave, then the amount of light exposing the film or sensor is always the same. However if the exposure pattern gets out of sync with the sine wave, then the exposure isn’t constant, and we record darker and brighter frames, which we see - as a flicker. Now things get really interesting. Let’s go back to the statement that only one of the two factors, frame rate or shutter speed -slash- shutter angle, have to be right to avoid flicker. I’ll start with frame rate. When you’re shooting at 30 frames per second under 60Hz lighting, you can use absolutely any shutter angle or shutter speed you want. Why? Because the frequency and the frame rate are evenly divisible, meaning that each frame starts recording at the same point on the sine wave, which means no matter the duration of the exposure, it’ll always end at the same point of the sine wave on every frame. Because every exposure starts on the same point of the sine wave, the shutter speed can be anything you want (that fits in that time limitations we discussed earlier of course) and you’ll have an even exposure. The math is actually really simple if you go the other way and just divide your power frequency by whole numbers, allowing you to find all of “easy” frame rates. Remember, 60Hz is 120 peaks per second, which is ultimately what we’re concerned with, so 120 divided by 1 of course is 120, meaning you can shoot easily at 120 frames per second. 120 divided by 2 is 60 frames per second, by 3 is 40, 4 is 30, 5 is 24 fps, and so-on. If you’re shooting in a 50Hz environment, then you can shoot flicker free at any shutter angle or shutter speed at 100 frames per second, 50, and 25. Now that we know what frame rates are easy to shoot at, what happens when you want to shoot a frame rate that’s NOT evenly divisible, like 105 or 75 frames per second, or more likely, you need to shoot a “common” frame rate for you but you’re shooting outside of your home region — for example, shooting 30p in a 50Hz region. Well remember, to avoid the flicker you only have to get ONE of the two factors aligned, and since frame rate is not in alignment, that means that shutter speed MUST be perfect. So what does that actually mean? Let’s use shooting 30 fps under 50Hz lighting as our example. When you divide 50 Hz or 100 peaks by 30 frames, you end up with three and one third peaks per frame. So that means each frame does NOT start its exposure on the same part of the wave. This uneven starting point means that for most exposure durations — shutter speeds — the amount of light hitting the sensor during each exposure will be different every time, resulting in an uneven exposure across frames, which is where the flicker comes from. But it turns out that if the exposure starts AND ENDS at the same PART of the wave — the same point along that curve — then the total light reaching the sensor will in fact be the same in every frame! Each frame can have different starting point — as long as it ends in the same position that it started on. So to get consistent exposures across every frame, the exposure itself EITHER has to start at the same point of the wave for EVERY frame of video and then can end anywhere, OR the exposure has to start and end at the same position on the wave — but that can be anywhere along the wave, and different for every frame. So, how do we figure out what that shutter speed should be? That’s just math, and there are plenty of tools out there to make it easy. I like the website red.com/flicker-free-video and the app FLICKERfree on iOS — I’ll link to both of those below. You just punch in your frame rate and choose 50 or 60Hz and it gives you the shutter angle or shutter speeds to safely shoot at. But because I really wanted to understand this, I dug up the formula, and made my own calculator. Here’s the formula. One over the frame rate, times the shutter angle over 360, equals N (an integer, or whole number) over the frequency. Continuing with our 30p in a 50Hz region example, that means available shutter angles are one over 30, times A over 360, equals one over 100, so A equals 108 degrees. The next integer is 2, so divide by 2 and you get 216 degrees, then by 3 and it’s 324 degrees, and the next would be 432 however we can’t have more than a 360 degree shutter, so 108, 216 and 324 degree shutters are our options. Great! Now, how about converting those shutter angles to shutter speeds? Ironically, as much as I appreciate shooting in shutter angle, when it comes to avoiding flicker, it’s actually a LOT easier to just work in shutter speed because no matter the frame rate, the math always reduces back to the same few shutter speeds. The hard math is to multiply the shutter angle as a fraction, like 108 over 360, by one over the frame rate, like 1 over 30, and you get a shutter speed. But no matter the frame rate, the answer will always be one the same numbers. For 60Hz power sources, those numbers 1/120th of a second, 1/60th, 1/40th, 1/30th, and 1/24th. For 50Hz sources, they’re 1/100, 1/50, 1/33⅓, 1/25 and 1/20th. How do we arrive there? Well… pretty dang easy. 120 peaks divided by one is… 120. 120 divided by 2 is 60, by 3 is 40, by 4 is 30, by 5 is 24. 100 divided by 1 is 100, by 2 is 50, by 3 is 33⅓, by 4 is 25. Nice and easy. The problem is most cameras don’t accommodate all of those shutter speeds. Most cameras give 1/125th of a second, not 1/120. You’ll probably find 1/100th, 1/60th, 1/50th 1/40th and 1/30th, but not 1/33 and a third, and finally you’d have to choose 1/25th instead of 1/24th. 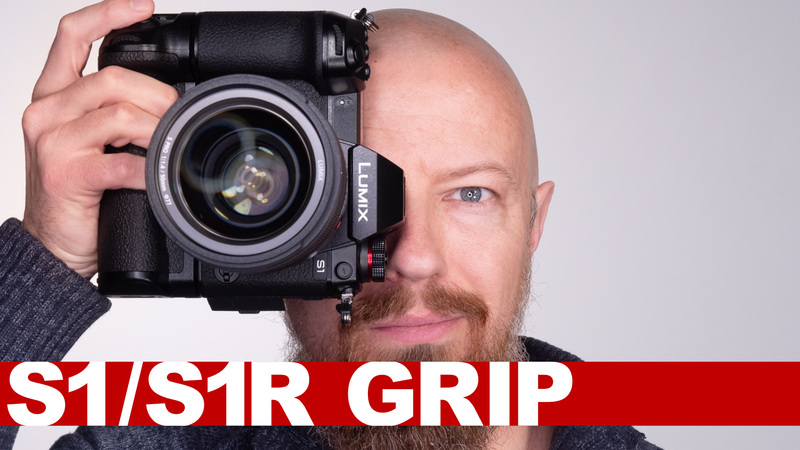 If your camera is capable of working in shutter angles though like the LUMIX GH5 and GH5S, you can be more accurate by selecting shutter angle instead of shutter speed. But for most uses, relying on shutter speed is perfectly fine. OK! There’s ONE MORE point I want to make, and that’s why you can’t shoot really high frame rate under AC powered light. Sort of. Remember in the beginning I said “the shutter angle can’t be any bigger than 360 degrees, or open all the time. This is an important point; remember that.” Or that the shutter speed can’t possibly be more than one over the frame rate. At 30p, an exposure can’t be longer than 1/30th of a second, or it’d overlap into the next frame. Under 60Hz lighting, with 120 peaks per second, we now understand that we can’t have less than a full wave exposing a frame without introducing flicker. The minimum exposure duration is going to be one full wave. Anything less would mean we wouldn’t be starting and Ending the exposure on the same position of the wave. Which means we can’t shoot anything faster than 1/120th of a second. Which means we can’t have more than 120 frames per second. I had to dig into this answer a bit but what I’ve learned is that essentially really big lights, as you can imagine, burn really hot. Light bulb filaments get bright because they get hot; the flicker is happening because they are gaining and losing power through the sine wave of power delivery, effectively heating up and cooling down 120 times per second. Really big bright bulbs do the same thing of course, but since they burn SO hot they don’t cool down as much, and therefore the flicker is barely noticeable. Plus I would imagine that shooting at 2,000 frames per second means the flicker becomes much less noticeable since a flicker we’d normally see over a single frame is stretched out to almost two seconds so the variation would become much less noticeable. If anyone watching this can expand on that in the comments, I’d love to learn more. Well there you have it. Now you know WHY the shutter speed has to be so precise, and what’s actually happening that causes the flicker, and how to avoid it. And, why you can’t shoot over 120 frames per second slow motion video under AC lighting (or 100 frames in a 50Hz region) without taking total control of the light. Hey if you learned something today, I’d love it if you liked and subscribed, but also, do me a favor and share the video! Just hit the share button below, post it on Twitter or forward it to a friend. And also be sure to check out the pinned comment below; if there are any updates to this video, that’s where you’ll find them. Next up, watch the live Q&A that followed this premiere, or check out the videos I mentioned, in the playlist below. See you next time!